Frank Robinson, who became a legend as one of the greatest power hitting outfielders in the history of Major League Baseball (MLB), as well as the league’s first Black field manager, has died. He was 83. According to Major League Baseball, Robinson died at his California home after a lengthy illness. But, over six decades as a 14 time all-star, two-time league MVP, two-time World Series champion and baseball’s last triple-crown winner, Robinson ascended as an integral figure in MLB’s pantheon. 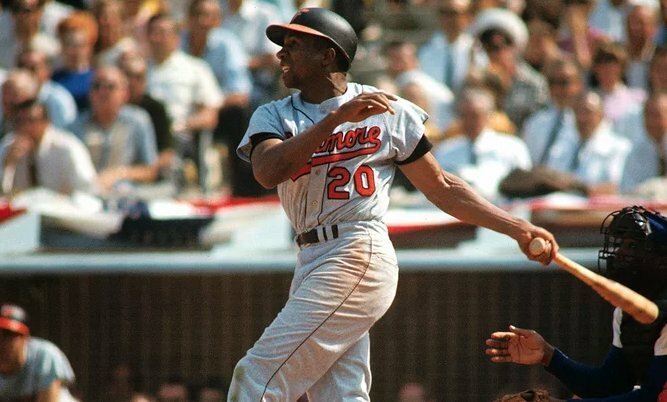 When he was traded to the Baltimore Orioles from the Cincinnati Reds in 1966, Robinson almost single-handedly changed the fortunes of the Orioles organization. Robinson not only added one of the most powerful bats in baseball to the Orioles lineup, as well as a gold glove to the outfield, his aggressive playing style and fierce competitiveness transformed the team’s clubhouse. That first year as an Oriole, Robinson captured the rare triple crown, leading the league in home runs, runs batted in (RBI) and batting average and led the O’s to their first World Series title. The Orioles not only won the championship, but they swept the favored Los Angeles Dodgers in four games, and no player has captured the triple crown of baseball since Robinson’s prodigious 1966 season. At the end of the 1966 season, Robinson also earned his second league Most Valuable Player award. In 1970, Robinson led the Orioles to another World Series victory, this time over his former team the Reds. At the end of his playing career Robinson finished with 586 home runs (10th all-time), 1,812 RBI, 2,943 total base hits and a career batting average of .294. But, his impact on the game was far from over. In 1974, the Cleveland Indians made Robinson the first Black manager in Baseball history. Robinson also managed the San Francisco Giants, which made him the first Black manager in the National League, the Baltimore Orioles and the Montreal Expos as they made the transition to the Washington Nationals. Robinson is still the only player in the history of Major League Baseball to win the Most Valuable Player award in both leagues.